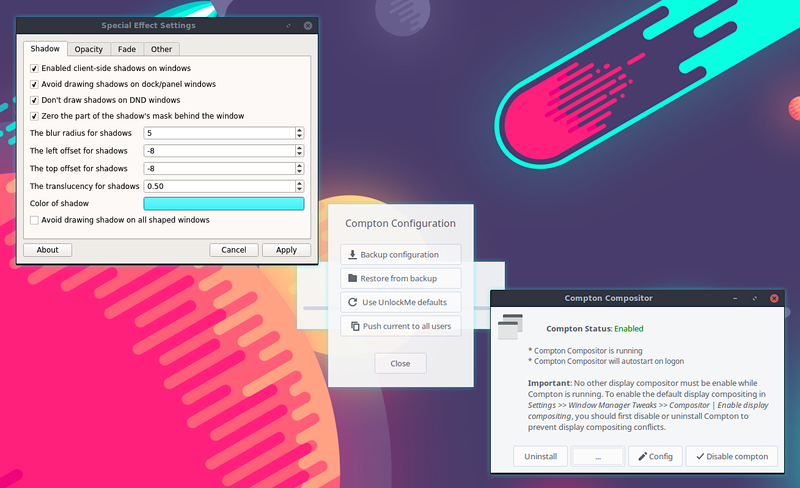 Just commited new changes - compton config Editor and a new default compton.conf to be able to manage compton from a simple UI. Topic: Can you help to keep a mirror alive? Can you help to keep a mirror alive? I encountered the same issue. The fix is rather simple. I have written a little bash script to get it done. Topic: Mint in VirtualBox in Windows ... Cinnamon Crash? Re: Mint in VirtualBox in Windows ... Cinnamon Crash? Shryp wrote: Another thing that would probably help is to change the update frequency. I changed my update manager to check for updates every 12 hours instead of every 30 minutes. It seems this is also going to be addressed in the next release. A less aggressive interval will be implemented. martijn.niji wrote: ralphy, I did. Works just fine. I probably wouldn't recommend this approach to newbie users that don't know what they're doing... and I'd prefer the Linux Mint project to fix it officially, but for my purposes this is enough. You're very welcome martijn. I hope it helps others as well. martijn.niji, you could try using the mirror in my post above if you are comfortable adding it manually (it isn't in the official mirror list yet) and you will be served from the servers in EU.